The key to a healthy, happy dog is often similar to humans; enough love, care and attention, plenty of exercise and a healthy balanced diet providing optimum micronutrient intake. SuperDog Health & Vitality contains a comprehensive blend of essential nutrients at optimum levels for healthy dogs. SuperDog Health & Vitality has been scientifically formulated with nutritional experts in canine health to provide advanced nutritional support for your four-legged friend. The formula contains 26 vital nutrients to help safeguard your dog's diet, whatever their size or breed. SuperDog Health & Vitality provides a range of vitamins for dogs, including the antioxidant vitamins A, C, D and E to help protect against the harmful effect of free radicals, plus essential minerals zinc and selenium to support your dog's natural defence system. Keeping your dog's skin and coat in healthy condition is one of the most important things you can do. Linseed oil contains a source of Omega-3 fatty acids which can help maintain a glossy coat and healthy skin. Superdog Health & Vitality provides seaweed which contains natural iodine, minerals, amino acids and vitamins to help support coat growth and colour. The specific micronutrients in SuperDog Health & Vitality can help support a healthy nervous system. Effective levels of B-complex vitamins in the formula may also help to keep your dog in good temperament. SuperDog Health & Vitality provides L-Carnitine and L-Lysine to help with weight management, maintaining heart health and promoting a good metabolism. SuperDog Health & Vitality is available in delicious braised beef flavour that your dog will love. SuperDog is a complementary pet food for dogs - it is not a treatment or medication. If your dog has symptoms or is unwell, seek veterinary advice immediately. SuperDog Health & Vitality is available at Morrisons, Holland and Barrett, Amazon, Fetch and online here. Optimised level comprehensive canine supplement. 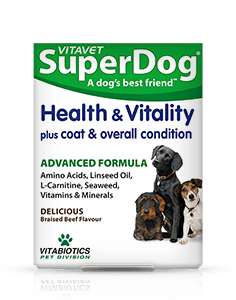 Why has SuperDog Health & Vitality tablets been developed? 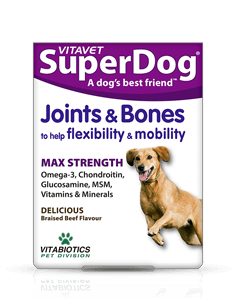 Can SuperDog Health & Vitality tablets be used simultaneously with medicines? How many tablets does one pack of SuperDog Health & Vitality contain? How and when should SuperDog Health & Vitality be used and what are the precautions? For how long should SuperDog Health & Vitality be used? "This vitamin is great for keeping my coat shiny and my tail wagging. Woof woof. love Buddy. x "
"I have had excellent results with all products purchased from Vitabiotics, including the supplements for my dogs." "After taking SuperDog Health & Vitality for just a month Sweep’s coat is lovely and shiny. Sweep loves taking his vitamins and it is something I defiantly will continue with him! " "I have two Springer Spaniels aged 9 and 5 years old. They have both been taking Vitavet SuperDog Health and Vitality and I can see a visible improvement in both of them. Their coats have a better condition being shinier and softer and the older dog seems to be more energetic, I would certainly continue to use the tablets." "Our retired greyhound racing champion from the North East of England (Sunderland Racetrack) relied on SuperDog for aging joints and wellness later in life.”"
SuperDog Health & Vitality is suitable for all size and breed of dog. Not suitable for puppies under the age of 12 months. Vitavet supplements are made using the purest ingredients to strict pharmaceutical quality-controlled GMP standards (Good Manufacturing Practice). Always read the product directions before giving to your dog. Do not give your dog more than the recommended intake. As with other food supplements seek professional advice before use if your dog is under veterinary supervision or has any underlying medical condition or if on medication. Vitamin supplements are not intended to treat or prevent any disease. Food supplements must not replace a balanced and varied diet, and a healthy, active lifestyle.